The Squire Tobacconist has been serving the Charleston, West Virginia area since 1993. In June 2013 we officially opened at our new location. It features a large walk-in humidor with more than 1.0000 separate facings of premium cigars. We also stock a wide assortment of pipes, pipe accessories, and tobaccos. Our store features a comfortable smoking lounge where customers can relax and enjoy their smokes. Our mission is to provide customers with quality products at a fair price, and to create a friendly atmosphere whereby tobacco enthusiasts can shop, meet others who share their passion, have fun and learn more about what it means to enjoy a fine smoke. If you're in the Charleston area, we invite you to visit our shop. Stop by, relax, and enjoy a fine cigar in our lounge, where cigar and pipe smoking is not only allowed, but highly encouraged. We will assist you anyway we can in making your next visit to The Squire Tobacconist a pleasurable experience. Conveniently located in the Patrick Street Shopping Plaza, just off I-64 and seven minutes from Yeager Airport. There is plenty of free parking right in front of the door. Take Exit 56 (Montrose Drive) and then turn left off the exit, and then turn right onto MacCorkle Avenue SW. Proceed eastward for about 1.5 miles, then turn left across the Patrick Street Bridge. At the foot of the bridge, turn left at the traffic light to enter Patrick Street Plaza. Take Exit 56 (Montrose Drive) and then turn right off the exit, and then turn right onto MacCorkle Avenue SW. Proceed eastward for about 1.5 miles, then turn left across the Patrick Street Bridge. At the foot of the bridge, turn left at the traffic light to enter Patrick Street Plaza. 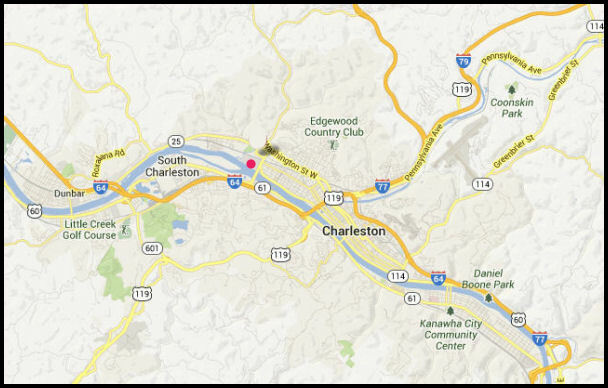 As you enter Charleston, take I-64 WEST, and proceed west and then take Exit 56 (Montrose Drive) and then turn right off the exit, and then turn right onto MacCorkle Avenue SW. Proceed eastward for about 1.5 miles, then turn left across the Patrick Street Bridge. At the foot of the bridge, turn left at the traffic light to enter Patrick Street Plaza. 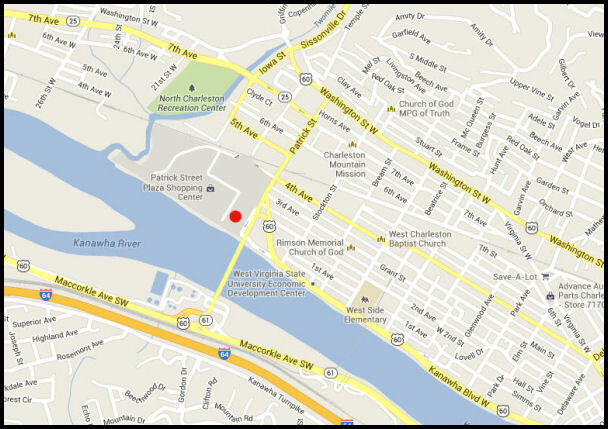 Proceed to Kanawha Boulevard (next to river). Turn right (West) and follow the four lane until it ends at Patrick Street. Stay in left lane, and proceed straight through the traffic light to enter Patrick Street Plaza.